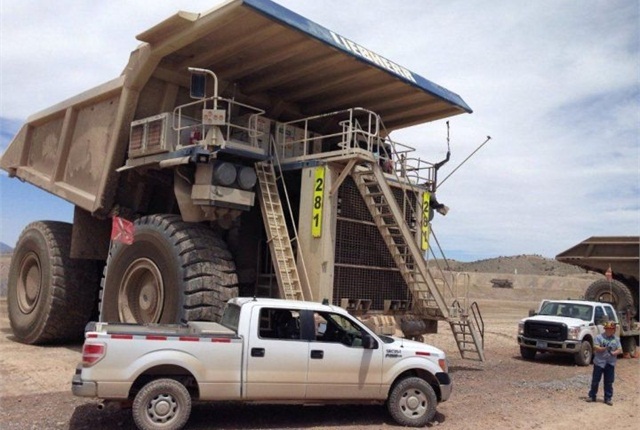 Barrick Gold Corp. has begun acquiring Ford's aluminum-body 2015 F-150 pickup trucks for its Nevada gold mining operation after testing prototypes in hard operating conditions. Barrick has placed an initial order for 35 leased 2015 F-150 pickups and plans to eventually add several hundred to its work truck fleet. Barrick plans to add about 35 per year, according to Louis Schack, Barrick's communications director. The initial F-150s will come as SuperCab four-wheel-drive models with a mix of 3.5-liter V-6 and 5.0-liter V-8 engines. Rebecca Caudill, Barrick Gold's fleet manager, was impressed with the durability of the lighter trucks during testing that began in 2011. "The F-150s see tough duty from operations supervisors, exploration field technicians, project managers, maintenance technicians and closure personnel," Caudill said. "Many of the trucks go into extremely rugged conditions during the planning and mapping out of new projects, core drilling and daily mining operations. Our trucks will see 30,000 to 35,000 miles per year, accumulating well over 100,000 miles in the 40-to-45-month lease rotation." Barrick Gold was one of three fleets selected by Ford for initial testing of the aluminum truck prior to launch. Other prototype vehicles went to Walsh Construction in Holtwood, Pa., and Birmingham, Ala., and a regional utility company in North Carolina. The Barrick surveying team drove the vehicles through severe terrain at the company's Bald Mountain and Cortez mines, including travel into mine pits before and after blasting. Barrick operates five mines in Nevada. The fleets weren't told about the aluminum alloy components added to the prototype trucks, which were named X0 and X1. Barrick drivers began to suspect the trucks had incorporated aluminum when they saw scratched-off paint and no rust, said Denis Kansier, a Ford product engineer. The military-grade aluminum alloy contained no steel. After initial testing of the X0 prototype by Barrick, Ford increased the thickness of the bed to 1.4 millimeters, a 60 percent increase from the 0.85-mm thick steel bed on the 2014 model. The new bed is also 40 percent lighter, Kansier said. The F-150s were equipped with pintle hitches so they could tow generators, pumps, welders, and equipment trailers. Barrick operates a fleet of mostly 850 leased vehicles, including 350 F-150s, 225 F-250s, 125 F-350s and larger trucks, 125 SUVs and vans, and 25 other vehicles. Barrick uses Wheels Inc. as its leasing service provider.